In April, I had the privilege of visiting a truly innovative nature sanctuary in Wellington called Zealandia. I was there to meet Dr Danielle Shanahan, a former CEED post doc who is now the sanctuary’s Manager of Conservation and Research. 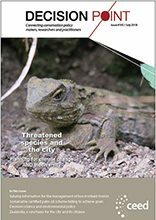 Visitors to Zealandia get the chance to wander its 225 hectares of native plantings and interact with a broad range of wildlife, much of it listed as endangered (like the reptile-like tuatara featured on this issue’s cover). Zealandia’s impact and legacy operate on multiple levels (many of which are explored in Danielle’s story). The sanctuary is a test bed for experimentation in restoration and threatened species management, and a refuge for many endangered species. Some of these threatened species (many of which are birds and impossible to constrain to the sanctuary) are now moving out from Zealandia into the surrounding suburbs, a process sometimes referred to as the halo effect. I think there’s another halo effect at play here, too; one involving community values. I asked a couple of Wellington locals what they thought about Zealandia and they told me it’s a much loved city asset and tourist drawcard but that it hadn’t always been that way. The recent development of a tourist centre at the sanctuary had cost the public purse millions of dollars and there were many protesting voices saying the money should have been devoted to other government priorities. However, as Zealandia has demonstrated its tourism and conservation credentials the protests were replaced by wide spread community support. These days, Zealandia is seen as an important attraction to Wellington and as a focal point of restoration, conservation science and environmental education. It has signed up hundreds of volunteers and thousands of members (Friends of Zealandia). The surrounding landscape (outside of the sanctuary) is increasingly being managed to be ‘friendly’ to native wildlife and the presence of long disappeared species spreading out through the city is a thing of civic pride. Some people contend that ‘real’ conservation happens outside of our towns and suburbs, and that cities are for people. And yet it’s the values of these people that ultimately determine government priorities so maybe we should be paying more attention to bringing wildlife into the hearts and minds of our metropolitan citizens.